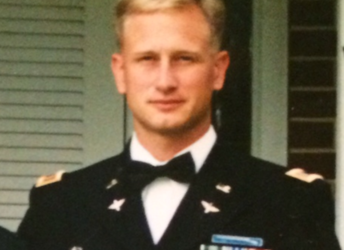 First Lieutenant Jeffrey C. Davis enlisted in the Army in July of 1985 and began his career with the 3rd US Infantry, serving two terms as Sentinel of the Guard at the Tomb of the Unknown Soldier at Arlington National Cemetery. Following the completion of a training mission on January 31, 1998, most of the crew had headed home to watch a big football game. 1LT Davis volunteered to stay behind and help do maintenance on another aircraft. During the maintenance, a malfunction occurred on the Black Hawk’s locks, which shook the helicopter apart. At the young age of 31, 1LT Davis suffered extensive head trauma from the accident and passed away later that day. During his enlisted years, 1LT Davis reached “triple tabber” status earning his Airborne, Ranger and Special Forces tabs. He attended the Special Forces Qualification Course and then served with 1st Battalion 3rd Special Forces Group (Airborne) from November of 1991 until August of 1992. After reaching his goals as an enlisted man, 1LT Davis was awarded the Green to Gold Scholarship for (ROTC) Reserve Officer Training Corps which allowed him to return to school and earn his bachelor’s degree from Central Michigan University in education, where he was the Distinguished Military Graduate. After graduation from CMU, he was commissioned as an officer in the Army and became a Black Hawk pilot. Following flight school, 1LT Davis worked as the 159th Regimental Assistant S-4, as the Rear Detachment Operations Officer, and as the Platoon Leader for 1st Platoon, Lima Company, 159th Aviation Regiment. He left behind a wife, three-year-old daughter and one-year-old son. His children were Folds of Honor Scholarship recipients. His daughter is now a member of the Folds of Honor Speaker’s Bureau.